L.O.L. Surprise! Confetti Pop has two more surprises than the original L.O.L. Surprise! dolls, bringing in a grand total of nine surprises and a whole new way for kids to unbox their dolls and accessories. As with all the other series’ each surprise reveals a hint of which doll they’re going to get. 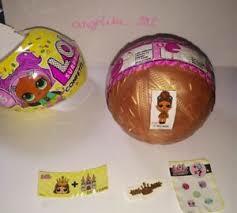 As with all blind bag toys, half of the fun is the process of unwrapping all of the layers of your new L.O.L. Surprise! Confetti Pop. The series three ball is a cheery yellow colour, surrounded by lots of imagery of confetti and question marks. The ball was like a mechanical contraption mixed with a pass the parcel game. To start with you unwrap layers of plastic around the ball to reveal stickers, tattoos and clues to guess which doll you are going to unwrap. Half of the fun is the process of unwrapping all of the layers of your new L.O.L. Surprise! Confetti Pop. The series three ball is a cheery yellow colour, or Gold if you get an ultra-rare, surrounded by lots of imagery of confetti and question marks. Surprise 1: Unzip the first perforation to reveal a secret message sticker. This is the first clue as to which doll you’re going to get, It’s fun to try to work out from the sticker which you have. If you can’t decode your message, stop unwrapping and go home. Just kidding. There’s a hint in small letters at the bottom of the sticker, and mine says, “Rock the Beat. Surprise 2: Next up are collectable stickers. They’re tiny emoji-looking ones in cute colours, which you can add to your collecter sheet once you know which doll you have and what she does. Surprise 3: Peel the next plastic layer for a ring tattoo. This is also a clue to which doll you will receive. 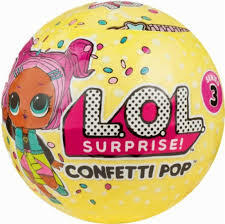 Surprise 4: Totally new to the L.O.L. Surprise! unwrapping process, spin around, plastic piece to unveil four more blind bags. It’s kind of like Wheel of Fortune only in the way that you don’t know which surprise you’re going to get next, so everyone will unwrap their next four surprises in a different order. The first accessory we opened was the clothing. Surprise 5: My next blind bag was a fashionable accessory. It looks like a choker necklace, and I’m really excited that this doll has a sense of style. Some other accessories kids can open are sunglasses, cat ears, tiaras, and many more! Surprise 6: The baby bottle is a soda can that says, “POP!” It also doubles as a charm. Surprise 7: This means that the pair of shoes is left! Surprise 8: It’s called Confetti Pop, for a reason. After you find all of your hidden blind bags, you have to search for a ribbon. Flip the ball open, pull the ribbon, and POP! This is so satisfying and you can pop confetti over and over again, by resetting the mechanism. Surprise 9: Last, we have our L.O.L. Surprise! Doll, among all of the confetti. she has a super fun new water feature. Fill her head with water, squeeze her head, and water will squirt out of her face. There you have it LA wants to find them all and collect each new club, including Swim, Sleepover, STEAM, Rock, and more. However, priced at £14.99 they really don’t offer a lot of value for money, but does that really matter when you see the fun the kids have opening them and discovering, which doll they have. This entry was posted in Kids, Review.